In hindsight, visiting Sucre was a mistake, really. It’s not that it’s not a nice city. But when we booked our tour of the Uyuni salt flats, we needed to tell the travel agent which bus we wanted her to book for us for when we returned, and it was either off to Sucre or back to La Paz. We didn’t really know much about Sucre, but we hadn’t been there yet, whereas we’d been to La Paz (and were going to be back there again), so why not something different? That said, just because it wasn’t worth it, doesn’t mean that it was terrible. 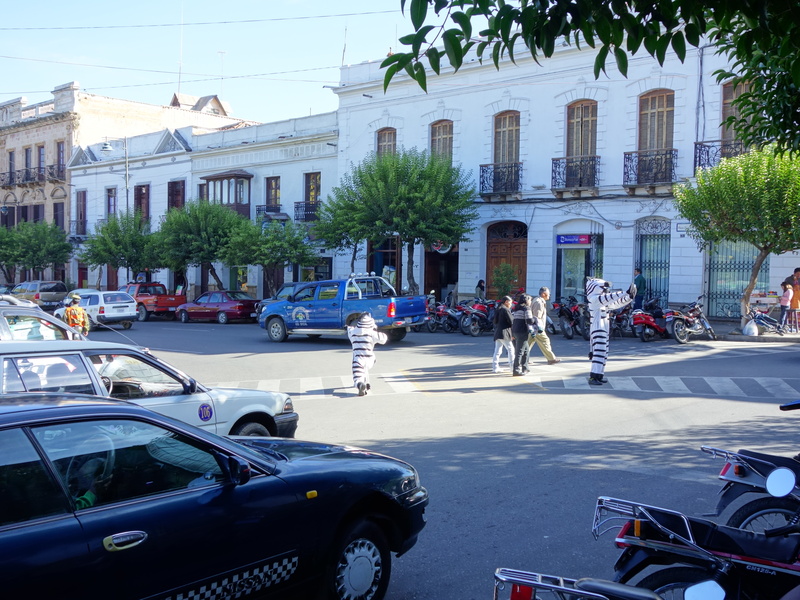 In fact, Sucre is a lovely city – cleaner and prettier (and lower!) than La Paz, and with a nicer collection of restaurants and cafés. Actually, it’s a city that a lot of tourists find themselves spending a lot of time in: if you’re looking to find a nice (and cheap) city to just relax in for a bit, or maybe for somewhere to learn Spanish, or maybe to find a place to volunteer, then Sucre would be a great spot. It’s just that if you’re coming through in the hope of finding interesting attractions to go visit or unique experiences to be had, well… there are better alternatives. 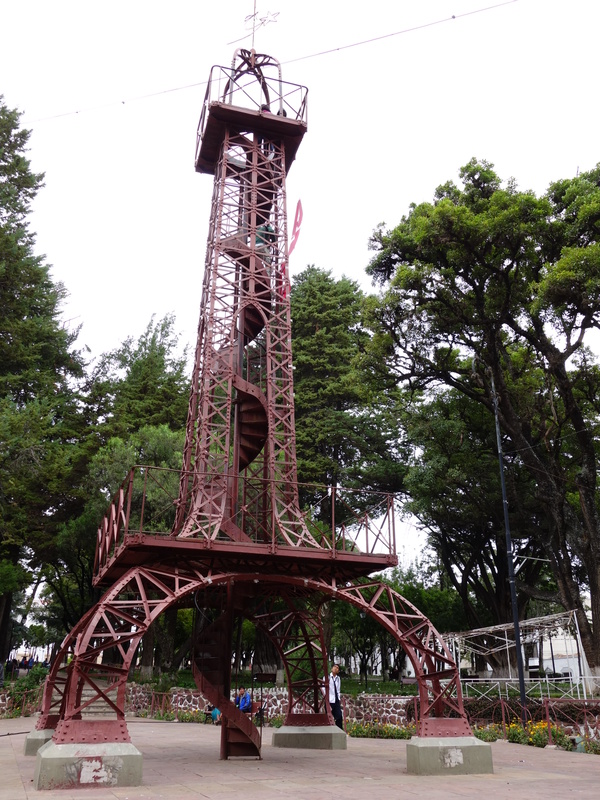 One of the higher-rated attractions, for example, is the 15m model Eiffel Tower in Simon Bolivar Park. Which is not particularly attractive, and doesn’t much look like the Eiffel Tower (albeit that it was in fact designed by Gustav Eiffel and shipped over from France). But actually the thing I will most fondly remember from Sucre is the pedestrian crossings in the main plaza, Plaza 25 de Mayo. We first saw them after we’d sat in the plaza on the Sunday morning of our arrival, waiting for something to open that could serve me some form of bacon and eggs. (Our bus from Uyuni was an overnighter that arrived at 3am – it parked on the side of the road once we got there and they let passengers sleep on the bus until 6, but then we had to find our own place to plonk our behinds, so we taxi’d to and sat in the square for a few hours reading while we waited for the city to come to life.) They were people in zebra costumes, policing the zebra crossings. (Well, traffic and pedestrian lights, but you get the point.) And they were loving it. Prancing and dancing, gesticulating madly at cars to stop and go, and escorting pedestrians across the street. Somehow, it was actually a quite mesmerising scene. Even better, we could all this from our favourite location in Sucre: Abis Café, on Plaza 25 de Mayo, where we spent far too much time drinking their coffee and milkshakes, and eating their fantastic breakfasts and salads. Other than that, we spent our time relaxing and figuring out what else to do in Bolivia, and our only other particularly entertaining experience was the process of buying a plane ticket out of there. It was just like the olden days: you go into the airline’s office in town, talk to the nice friendly gentleman behind the counter, and buy your ticket for tomorrow, paying a fixed price (no extra “but you talked to a real live person” charges), and watching the dude use an old-fashioned slidey-style credit card imprint machine, etc. It sounds silly, and it was, but that was actually a highlight for us, given how often we buy plane tickets, and how much time we spend hunting around online to find the best price, and the airline which will charge you the least baggage fees, credit card surcharges, etc., and whose prices will vary the least between when you first look for it and when you actually book. It was a strikingly simple process, and we boarded our plane the next day reflecting on how different airline travel typically is these days. This entry was posted in Travel and tagged bolivia, sucre by Sam Roberton. Bookmark the permalink.